Without delay. Here's the bottom line--graphically. Justices Scalia and Thomas, perfectly politically conservative. Chief Justice Roberts and Justice Alito, very much so. Justices Ginsburg, Breyer, and Sotomayor, perfectly politically liberal. Justice Stevens (now retired), nearly so. 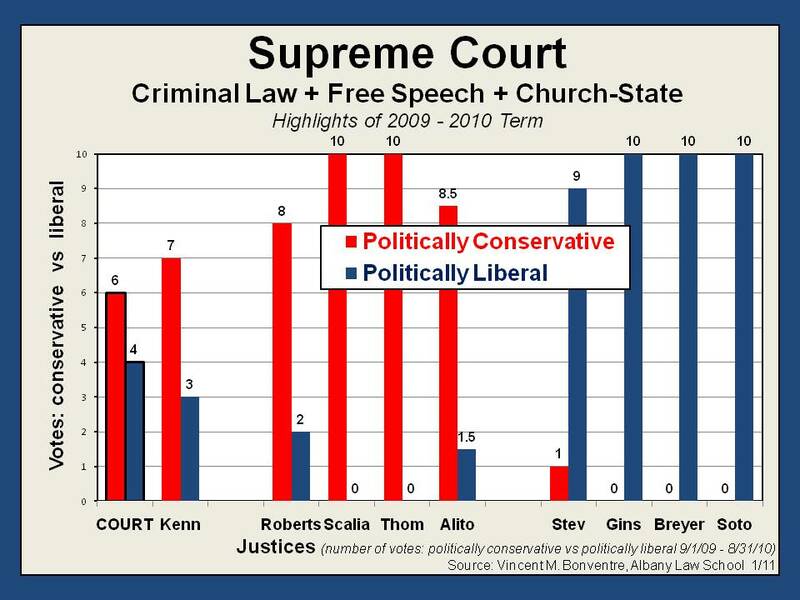 Justice Kennnedy, typically the swing vote, was significantly more politically conservative than liberal. The Court as a whole, slightly less so. Reviewing the cases that comprise the "Top Ten" highlights of the Supreme Court's last term, how would conservative Republican politicians generally vote? Liberal Democratic politicians? In short, if the issues in these most salient cases were to be decided by politicians rather than Justices--assuming, for these purposes, that they are 2 different species--how would the politicians vote? Then, compare how the politicians would vote with how each Justice did. So, how many times did each Justice vote the same way a conservative Republican politician would be expected to vote? And how many times like a liberal Democratic politician.? Again, to avoid presuming that the graph and my summary above is completely clear, those questions are what I asked in sorting the data, adding up the numbers, and depicting them graphically. 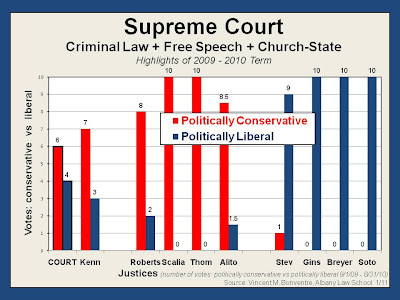 Now, looking at that graph again, the Court's political divide could not be more clear. It could not be more stark. The conservative Justices virtually always vote like conservative Republican politicians in the difficult, close, controversial, highly-charged cases. The liberal Justices, like liberal Democratic politicians. Let's state this differently to underscore the implications. The Justices very infrequently break from their partisan political mold. For 6 of the Justices in these cases, they never did. Again, 6 Justices never broke from their partisan political mold. And, in fact, all of the Justices--except, perhaps for Justice Kennedy--voted overwhelmingly exactly how either conservative Republican or liberal Democratic politicians would vote. Remember, these are close cases. Difficult cases in which it would be perfectly legitimate for the Justices and the Court itself to go either way. These are cases in which there is plenty of law, plenty of strong legal argument, plenty of good constitutional reasons to support either position. And yet, 4 of the Justices just happen to construe and apply the law to reach the same conclusions that conservative Republican politicians would support. And 4 of the Justices just happen to do so to reach the same conclusions that liberal Democratic politicians would. Of course it is true that a judge's political views--just like a judge's religion, experience, world view, etc.--influence the way the judge votes. Of course that's so. Regardless of the "impartiality" and "neutrality" and "objectivity" and "judges just apply the law" nonsense. Of course there are tendencies. But, we reach a whole different level of predisposition and preconception and just plain slant when Justices so overwhelmingly abide by partisan political positions. And that is the state of the current Supreme Court. This is not the description of a dispassionate, unbiased, non-partisan Court. This is not evidence of mere tendencies and unavoidable influences. This is the description of a Court that is as polarized along partisan political lines as is the United States Senate and House of Representatives. One last thing. Well, you might think, maybe if we look more closely, the division is really based upon judicial activism versus restraint. It's really about some Justices making law and some applying it. It's about some Justices crassly voting their political preferences and some Justices actually being faithful to the law. Maybe it's really about some Justices exercising raw judicial power, and others being much more reserved and respectful of the laws passed by the Congress and the states. It's about some Justices acting as though they should make the decisions for our democracy, and others understanding that the will of the majority as expressed in laws enacted by our representatives should rule. You know, unaccountable, unelected Justices versus the accountable, elected lawmakers representing the people. OK. We previously looked at that a bit in the criminal cases. (See Supreme Court: Highlights...(Part 12--GRAPHIC Recap of Criminal Cases [Restraint? Partisanship? ]), Jan. 26, 2011.) In the next post, we'll look at the data on that for all the highlights.